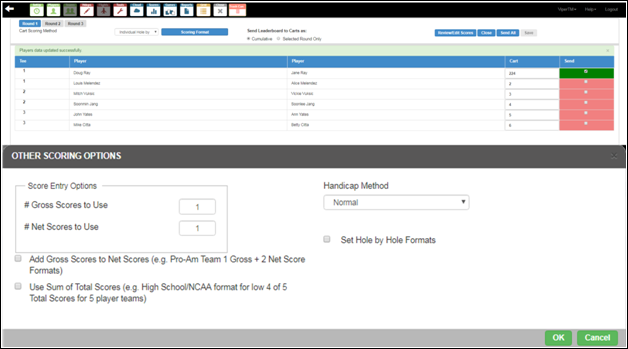 Setting up Live Scoring and Real-Time Leaderboards Interface along with installing an in-cart GPS System through Vision Perfect technical support allows you to send the player names to the cart welcome screens with the names which are also on the video scorecard. Viper will receive the live scores to create the real-time leaderboards and send back to the cart screen which you can view throughout the event. 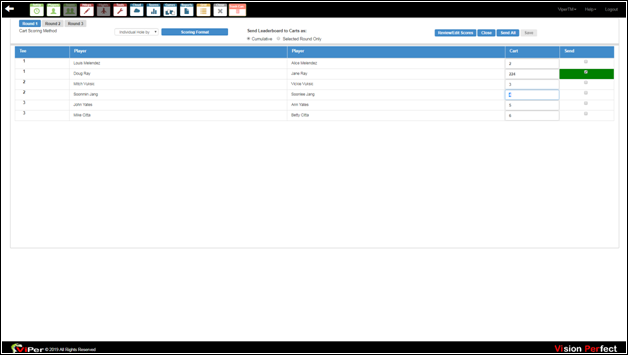 You can even post the live leaderboards on any web-enabled device anywhere across the world. Once you set up the event and assign players to the starting holes for time start, click on the ‘Cloud’ icon and open the GPS interface system to use this device. On the new window, choose a scoring format of your choice. As cart number manages the interface with the GPS so, cloud screen will display the cart pairings with starting holes and starting times. 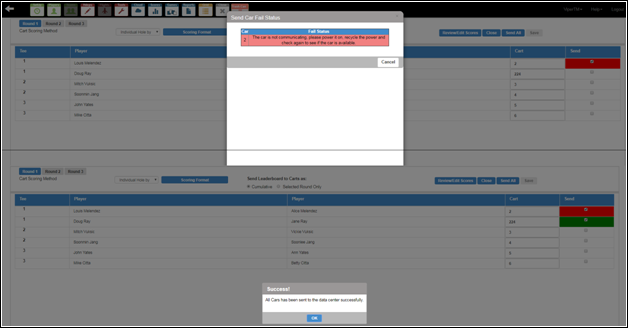 To enter the assigned cart number, click on the ‘Cart’ text field for a particular player and enter the necessary value. Once you check the ‘Send’ checkbox for a particular player, it will send the cars to the assigned cart number. Also, you can click on ‘Send All’ to send all the cars in one go to the assigned cart number. However, if the assigned cart number is correct, it will display the message ‘All cars have been sent to the data center successfully.’ In case, the assigned cart number is incorrect; it will display the message ‘The car is not communicating, please power it on, recycle the power and check again to see if the car is available.’ Thence, for proper communication between the car and GPS Interface System, you need to assign the appropriate cart number to the vehicle. To check the communication status of all the cars, go to ‘Clouds,’ then ‘GPS’ and then choose ‘Show All Cars Status’ from the menu. The red color shows the cars are not communicating; whereas, the green shows the cars are communicating actively. So, do not assign the inactive cart number for a particular event.